The people of Thoothukudi, who were asking for relief from cancers were given bullets as medicines. Common struggling people were portrayed as extremists and troublemakers and shot and killed. After hearing about the events that occurred and feeling nervous for my family and my people, I visited Thoothukudi, my birthplace on May 26. Thoothukudi is a coastal city, painted white from the vast salt harvesting pans with cool salty air wafting through. On this day, however, I was only greeted by empty ghostly streets hiding the chaos of conflict and suffering. The only people I could see were (police) barbarians carrying guns and lathis. The people of Thoothukudi were still shut in hospitals and their homes. The media was announcing that normalcy had returned to Thoothukudi, but what I saw were terrified people crouched in their homes, afraid to step out even to get medicines for the ill or milk for babies. Mothers with adolescent and young boys were anxious fearing their children would be plucked from their homes by the police. The first person I went to meet was Infanta. She was the friend of Snowlin, a girl who had been killed in the firing. Infanta was also beaten brutally by the police and she had been admitted to the government hospital. I met her around 3 pm on May 26. The 23-year-old had deep lathi marks on her back and neck but even so, it seemed as if those were less painful than the pain I saw in her eyes she had for her friend Snowlin. In many ways, she had not recovered from the shock of that violence. Initially, I thought I should not talk to her and disturb her. However, the world needs to know these truths. Therefore, I went to talk to her with as much empathy and delicateness as I could muster. After a little bit of conversation. I asked how Snowlin died. Immediately tears came from her eyes. But through the tears, she talked. 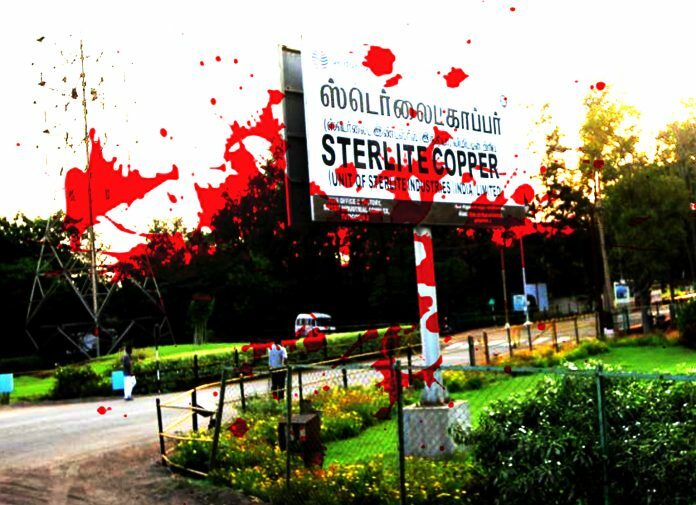 “We saw so many people that day at the protests that almost everyone of us thought that for sure the government will be obliged to heed our request and close this Sterlite organisation. Snowlin had the same hope. Me, Snowlin and one more friend were together the whole time during the protest. We were holding each other’s hands and walking forward with enthusiasm. When the procession reached VVT signal, someone was throwing the stones and one stone came and hit my head and immediately after that police lathi-charged us. After a small interval, tear gas was thrown at us. And in the tear gas haze, people were being beaten. To escape from this tear gas, we wrapped our dupattas around our nose and eyes and kept moving forward. In the front of the protests were 20 trans-women, and behind them cis-women, and behind them were men. People managed to cross over the stone throwing, the tear gas, the barricades, and take shelter in the Collector’s office. At first cis-women and trans-women entered the collectors office; only a few men were entering the collectors office. When we entered the Collector’s office, it was peaceful. We were also sitting there peacefully. Suddenly, a lot of police came from inside the office and lathi-charged us. We started running. Our friend who was with us tripped over the speed breaker and fell. She has asthma and she started wheezing. Snowlin and I went to pick her up . At that time, bullets were flying past us. We dodged the first two bullets . The next bullet I saw hit Snowlin’s mouth. And she fell with a thud. For some minutes I forgot myself. I became numb. And then even the lathi beating they gave me I was numb to . After that, we picked up Snowlin’s body and took her to the hospital on the way we saw about 20 bodies lying in blood.” Infanta said all this describing the scenery while shivering nervously. Bearing Infanta’s blood filled words in my mind, bearing the scenery in my mind, I went around 4 pm to visit the family of Terespuram Jansi, another victim of the shooting. All around the house they were a heavy air of misery. Jansi’s youngest daughter, a 10th or 11th standard student, was so sad that I could not express in words. In this young age, they had lost their mother. I could not even stand by them for a minute stably I wondered how these young children would bear this burden for a lifetime. I talked to Jansi’s older sister and her husband. Through her tears, her sister explained to me. “She went to buy fish for her eldest daughter living nearby. She went near the bridge and she saw the procession and the people and she stood there watching as a bystander. But watching the crowd was a crime to the police and they rained bullets on her. Her one side of the face was torn off. When she fell, they wrapped her body in a banner and put her in the police van and took her away. When we went to the hospital, they first told is there is no such woman here. We continued to ask and push them angrily. After that they showed us her blood-stained bangle. We screamed and wept when we saw that the bangle was our sister’s. The police are saying the protesters had weapons. But the weapon my sister had was the packet of fish she had in her hand for her daughter. If we catch fish they are shooting us (fishing in border waters between Tamilnadu and Sri Lanka is dangerous), if we carry the fish we caught, they are shooting us so how are we expected to live? ?” Jansi’s sisters question rung in my mind. Her question was a question for the whole state whose forces and actions have been oppressive. Laying grief after grief down in my heart, I went to visit the next person’s house where another man called Clauston, was eaten by bullets. His wife was there. She didn’t want to talk to anybody. She sat in a corner hoping that everything that had happened would turn out to be a bad dream. Hoping she would wake up any moment from this nightmare. She felt if she spoke that the nightmare would become real. She stayed alone. Clauston’s 11th standard daughter spoke to me. “Mother has not been talking to anybody, since father was shot by the police.” Hearing the child say that I was sure no one could hold back their sadness and tears. I was in dilemma as to whether to talk to that child or not. But she started speaking herself. “Can they give me back my father? We cannot leave this as it is, we have to take action”. I could only give her my tears as a reply. Then, I went to Peruni Jai where 61 men who were remanded illegally were being released. The swift action taken by Thoothukudi lawyers collectives had resulted in their release. But it wasn’t before they were first tortured. They had been taken to an ammunition hold in Wallanad. There they faced intense violence. Some people’s ankle was swollen and broken. Many people’s backs were bruised after they had been beaten with lathis. Some people sustained head injuries. They recounted their painful experiences. One of them said that Wallanad ammunition hold was no less than a concentration camp of sorts. That night I couldn’t sleep. I thought about how the government and the corporations are birthing novel ways to repress people. Our people too had to find new ways to resist. I thought about everything I had heard that day. I thought about Thoothukudi, a place I was born and raised in. I recalled the places where I would play as a child and the beauty of the town. But now Thoothukudi had become a literal hell. The next day at 12 pm I went to see their Snowlin’s mother. The mother who lost her beautiful girl, her beautiful warrior. Seeing her, I didn’t have it in me to ask this mother who is such deep pain any questions. iI just told her, “Amma all the daughters here are your daughters. Please take care.” In truth, such mothers are the mothers who birth this nation. Finally, I went to meet my brave people, the first row protestors, the “thirunangai” (trans-women) community. Transwomen are generally not given front row spaces at state-level issues but in Thoothukudi, it was the first time that the people demolished these Brahminical ideologies of gender that prevent us from joining protests or being a full part of larger society. I spoke to Reena. “We have seen a lot of suffering including untouchability and exclusion, but we have never witnessed such a cruel oppressive government. Many of us have lathi bruises. It was in front of us that Snowlin was killed. Even the lathi wounds will heal but watching Snowlin die….and the scenes of death and destruction…. that wound will never heal.” said Reena. I understood how much pain she was in. Offering her words of consolation I had to move on. How ordinary and every day are great revolutionaries I thought to myself. The next stop was Kumararettiyapuram village – a great big Neem tree sits at the centre. It is there that people come and meet, and is usually bustling. That day it was almost vacant. But about 5-6 woman was protesting there. They were also the elderly. “There are no youths here, daughter. They are all afraid of police and have disappeared to keep safe. But we are not leaving just yet, we are still here to fight.” Like old and rooted neem trees, these ladies also remain. Finally, at around 4.30 pm, I went to the hospital to meet more people who were injured by bullets but survived. I was speaking with them when the Tamil Nadu government order to close Sterlite was announced. I informed everyone. They showed little happiness and more anger. They could have done this much before instead of taking our lives and maiming us in this way. Is this government for us or is it for Vedanta? People suffering the outcomes neo-liberalisation, globalisation, privatisation all over the world are asking the same questions. The author is a Dalit trans-rights activist, the first trans-woman engineer in India, technologist at Project Mukti, and the founder of Trans Rights Now Collective.